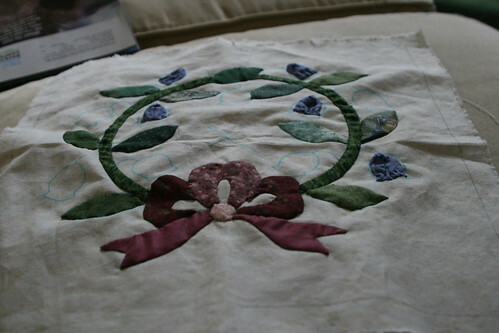 I'm spending some of this weekend quilting. I've joined the quilting group at church, full of lovely ladies who are a generation ahead of me in age. They are a lot of fun to talk to - they know all about the history of the church and they know a lot about quilting. We are doing a 20 square Baltimore album quilt and some of the squares that are done already are so incredibly beautiful, I don't even want to touch them. I am contributing only one square - passable, not incredibly amazing, but pretty good for a first go round. Deadline for the square is June 1st and I just finished it today! A week behind on posts. Car bomb and green PJs. Tile installation and new glasses. Back from a quick trip to NYC.